HOA corruption Archives - Page 3 of 168 - Neighbors at War! The link below is horrifying, but really should be read by everyone concerned about elder abuse. It involves state agencies that declare an elderly person ‘incapacitated’ and appoint a guardian who takes over that person’s care and gives the guardian unlimited access to the older person’s bank accounts. While I was an investigative reporter for the NBC affiliate in Denver I reported on several such cases. Then, attending my 50th class reunion last month, I spoke to a longtime neighbor (and a good-lookin’ gal, too!) about a different kind of theft. Seems that a sibling was executor of her parents’ rather substantial estate and that sibling stripped out all the assets. My friend didn’t get a dime of what her parents left her. Kansas City Star: HOA Central! No Comments on Kansas City Star: HOA Central! The Kansas City Star continues to be the premier newspaper providing in-depth news coverage of the national HOA abuse scandal. In this category, at least, the Star is acting like a national newspaper, not a City newspaper. People in all fifty states and Canada are following the expose’ by reporter Judy Thomas and her team. Finally, some true muckraking by a journalist who has the guts to stand up to this massive and corrupt lobby. No Comments on Idiots, Idiots, Idiots All! Just when you think you’ve heard the stupidest story ever about an HOA board, along comes an idiotic decision that just makes you shake your head. It’s election season, and you’d think Texans would have a little more common sense than most people. I spent some growing up years in Texas, and I loved considering myself a Texan. But combine the words ‘Texan’ and ‘Homeowners Association’ and you just get twenty-seven degrees of STOOPID. Shaming. It’s another word for bullying. For abusing. Often, public shaming is more hurtful than physical abuse. If you’ve never read Nathaniel Hawthorne’s 1850 novel, The Scarlet Letter, then you’re missing one of most powerful works in the history of literature. And if you’re honestly in this fight against the national Homeowners Association scam then you need to read Hawthorne to begin to understand how mean and horrible public shaming really is. 2 Comments on Organized Crime? You Betcha! Organized crime is endemic in the HOA industry, absolutely woven throughout the faulty fabric of the whole structure of Homeowners Associations. Racism, bribery, blackmail, criminal harassment, theft, extortion, embezzlement, phony liens and foreclosures. 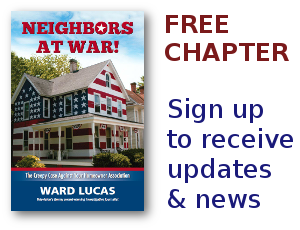 If you go back through five years worth of blog posts on NeighborsAtWar.com you’ll see hundreds, even thousands of posts and links to stories of criminal activity in Homeowners Associations in virtually every state in America. Board members, treasurers, management companies, HOA lawyers, even the federal racketeering convictions of 43 HOA officials in Nevada. It’s a vast criminal empire that only recently is beginning to attract attention from the nation’s news media. So this next paragraph and the associated link shouldn’t surprise you much. Though the mills of God grind slowly, yet they grind exceeding small; though with patience He stands waiting, with exactness grinds He all.